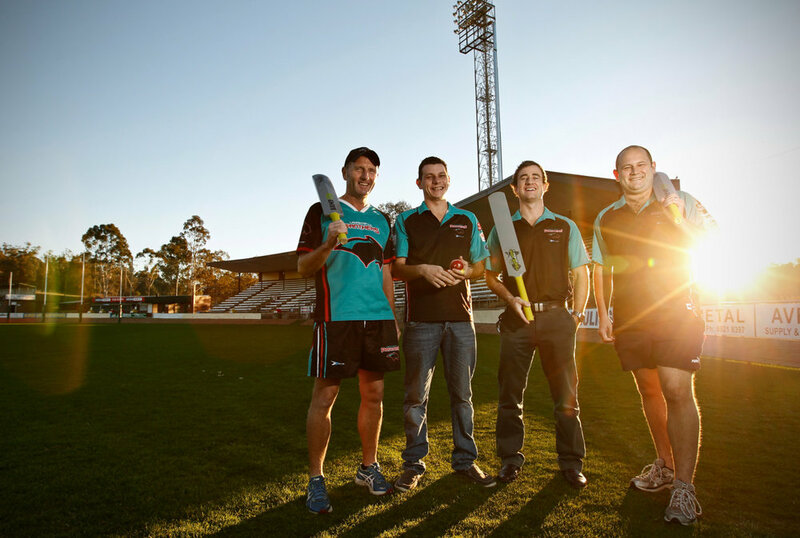 Four blokes, three cricket bats, a cute kid and a bit of sunshine. What more could a photographer ever ask for? Well, maybe a bit more time. The sun was dropping fast and I really had to hustle to get this shot done. So while my mouth was moving, hustling the talent onto the oval, my fingers were dancing over my Canon ID Mk IV, locking in some pretty standard settings for shooting into the sun. First, I tackled the ambient light … that being the light your flash won’t touch. Got my shutter speed up to it’s highest native sync speed (For me, that was *1/250th). Then, I got my ISO low (I was at 160). Then, I picked an aperture as a starting point (I went with about f4). And took a test photo. Second, I sorted out my flash exposure. I like to work manual, so I guessed an output of probably 1/8th or ¼th, and recruited the cute little kid to hold the flash pointed in the middle of the four blokes. Took another test picture. Flash exposure looked a bit hot on the blokes. At this point, I had a few options. I could turn down the power of the flash. I could ask the kid to take a step away from the blokes. Or, I could increase my f number and shrink my aperture a bit. All would dull down the flash exposure. I opted for the easiest adjustment, moved my thumb a bit and shifted my camera to f5, which was where we ended up for this picture. I shot several variations, some with the blokes blocking the sun from the camera (which left them beautifully rim lit), but I liked this look the best. It’s nice when, every now and again, your flash plays second fiddle to the best light source of all, the sun. Here’s the story that ran for the newspaper.